I am back from a two week mission trip to Tanzania led by my husband Bob Allen. This is his ninth trip to this country. There were 10 in this group ranging in age from 32 to 73. Six of the ten had been to Tanzania on mission trips before and the other four were newbies....a good combination as they all accepted the challenges in good spirits. We learned to laugh at the inconveniences faced each day that we take for granted at home, like water, hot water, electricity, bathrooms and how long it takes to receive your food after ordering. Our mission trip each year is focused on evangelism and church planting in Tanzania. Our denomination is Lutheran Church Missouri Synod but Christians of other denominations has joined us over the years. Most people assume we are going to do a work project such as build a school, clinic, or dig a well. While we are also open to such things on other trips, our goal is focused on spreading the gospel to the area that is home to the Sukuma tribe, a largely unchurched people group. We currently have a partnership with the Southeast of Lake Victoria Lutheran Church of Tanzania. This partnership means that pastors, evangelists and deacons from Tanzania work side by side with some long term American missionaries in Tanzania. I heard a comment several years ago by one of the Tanzanian pastors that struck me. He said in ten years these people will be Muslim or Christian. If you think your faith is good, why not spread it? Many Christians in America say they will go on a mission trip to perform a project but not to evangelize. In an area that still has many problems with witchcraft, why are we opposed to sharing the gospel? What better work is there? To give you an example of the work; each day the group splits up into teams comprised of an American who has done this before with a newbie, a translator and someone who is familiar with the village and knows where everyone lives. We also have a local person who acts as a scribe. Sometimes we need two interpreters to take us from English, to Swahili to Sukuma. It is often a long drive to get to the designated area each day. We walk with our guides into the areas and as we enter the boma (small groups of huts) we say Hodie...which means can I come in. People sit in the common area outside their small huts for most activities and use the huts for sleeping. 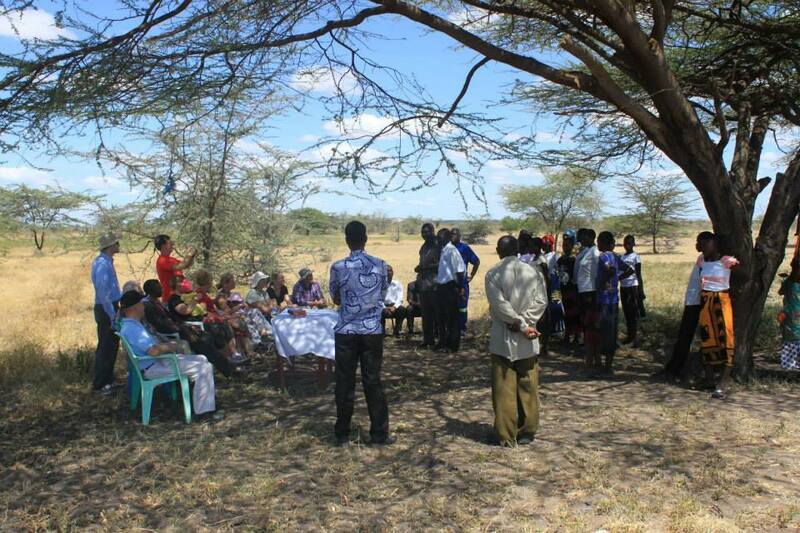 As they respond with Karibu (welcome) they are scurrying to find some place in the shadow (shade) for the guests to sit. We may sit on a tarp spread on the ground, small wooden handmade stools, overturned buckets etc. Tanzanians are known for their hospitality. After a brief introduction, we use the EvangeCube to present the simple gospel message. Many have never heard the name of Jesus. They listen with great interest as they receive the message and if they respond positively, they are asked if they would receive baptism. Water along with a bowl is brought for this. This is the point where a scribe comes in. They record the name of the person being baptized and the Christian name they select for their baptism. This is important for follow up by the local evangelist and the church planting team. We pray for their needs and a blessing over the boma as we leave. They may be invited to an evening service being held in that area. The church planting people of that area often start holding services in whatever facility they can find or simply under a mango tree. They eventually purchase a plot of land, clear it and build the church using hand tools. This labor is done by men, women and children. The bricks are made by them and the only thing purchased is the tin roof. This is truly their church built by their hands and they are very proud of it. They are led by trained pastors, deacons and evangelists assigned to that area. The challenge is getting enough trained to serve this fast growing population. It is not unusual for an ordained pastor have several sub congregations that he is overseeing. It is very encouraging to stop and visit areas evangelized in previous years and see the established churches and greet old friends. The people that go on the short term mission trip come home reporting that they are the ones blessed by the experience and the relationships established. They eagerly discuss the planning of the next trip. The team members return home with many stories that touched them and a fresh interest in the work of evangelism.